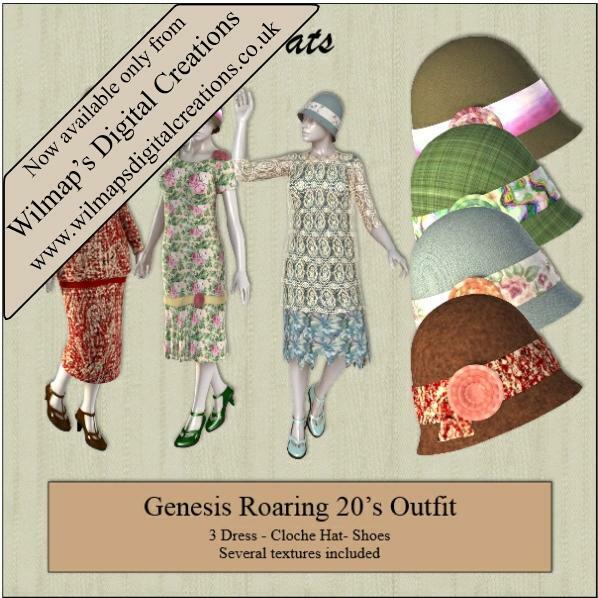 Roaring 20s style Cloche hat for Genesis for use in Das Studio 4.6. Several textures included. Parent hat to Genesis head and adjust to fit. luci45 (6 years ago) Inappropriate? Thanks! Great outfit. Looks like the real thing! @Wolf - I use Silo and I use UVMapper to UV map my items. Much easier than trying to do it in Silo or Hexagon. Wolf (6 years ago) Inappropriate? Do you use Hexagon to do your outfits? I'm having considerable difficulty with the UV mapping in that program. There should only be 4 hats. The hat.tiff file should not be there, it can be deleted. Wow, this is great! Thanks, Wendy, for these wonderful clothing items!